Given the gorgeous weather, and the fact that I had the entire day to myself since Gabriel was at the garden, I thought nothing of biking to and from our meeting place (Kaldi’s Coffee on DeMun). Well, I thought nothing of it until after we rode the route for the road tour of mid-county, by which point I had covered the six miles to our meeting point and the ten miles of the tour. Um, not so much, given that I was six miles from home. I went into autopilot at that point, choosing the most straightforward route and slowly pounding it out, bit by bit. Unfortunately, I was too tired and zoned to stop and chat with the couple heading the other direction on their bikes, riding on the sidewalk and looking thoroughly distressed about the fact that the sidewalk was ending and they were about to have to ride on the road (the very low traffic four-lane road where they could operate their bicycles peacefully and happily in a lane all their own, in reality much safer than their previous location). Apparently, my regular weight lifting, intermittent mile or two treadmill runs, and casual bike jaunts with Sir did not prepare me for a 22-miler. I arrived home a thoroughly pooped pup. No rest for the wicked, though, as I immediately jumped into dinner preparations (stewed tomatoes), knowing that a [garden-tired] Matthew and Sir would be arriving soon. Turns out I was not the only one who spent a large portion of the day spinning my wheels . . . .
Beginner cyclists will learn why sidewalk cycling increases risk, what Missouri & Illinois laws say about bicycles and cyclists, how to signal and communicate with motorists, practice critical bike handling skills, and proven techniques valuable for a lifetime of cycling. Intermediate cyclists will discover the importance of intersection integration, how to best handle multi- and single-lane roads, strategies for inclement weather, taking advantage of traffic flow, emergency maneuvers, and much more. Advanced cyclists will fill the gaps in their own understanding of how traffic works, learn how to better manage traffic on single-lane roads, discover how lane positioning actually helps motorists, and many concepts that are difficult to master through self-learning. “I wish I had taken it sooner,” say many of our advanced participants. 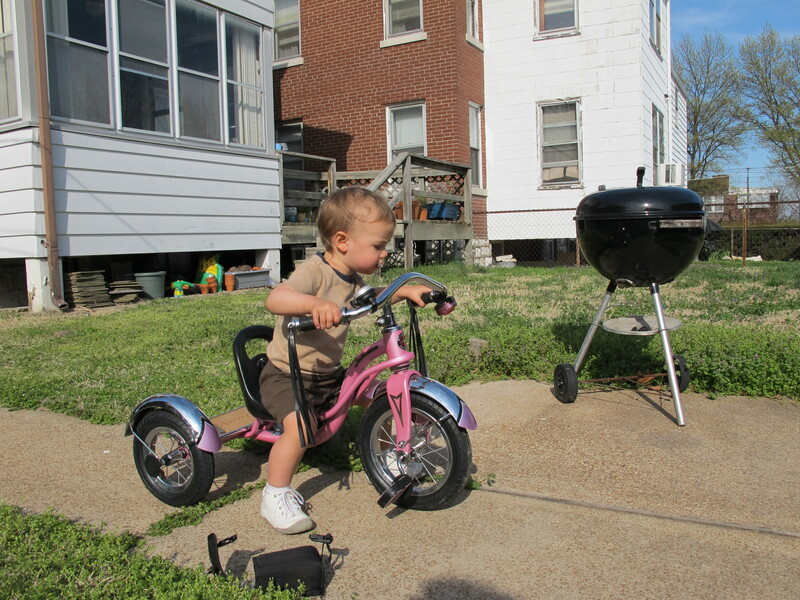 This entry was posted in Biking, Cuteness and tagged CyclingSavvy, st. louis. Bookmark the permalink. I wish I was there so I could take your class! Wish you were, too! Looks like the program needs to build a presence in the western states. I actually wish there was more of an effort to educate drivers around here as well as cyclists. There have been a number of really disturbing situations lately that just have me shaking my head. Lots and LOTS of hit and run deaths of both pedestrians and cyclists – one recently where somebody hit a woman crossing the street with 2 kids… the truck hit them, killed both of the kids and even drug the stroller for 2 blocks while fleeing the scene! And it seems like every time I’m biking on the streets somebody honks and yells obscenities – “Get out of the F-ing Road!” seems to be a popular one. But the city has put enormous resources into building bike infrastructure and developing a bike sharing program lately, so there are LOTS more bikes on the road, which is a good thing. There’s power in numbers, and the more people there are out there demanding change the faster it will happen.